If you want immediately murder someone in the newest Hitman episode, you can do that. You can also just stand around listening to this one dude talk on his phone. 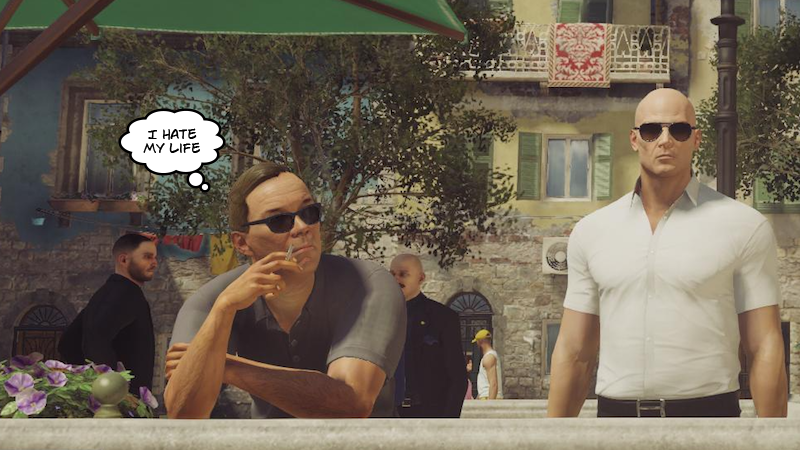 The new episode sends Agent 47 to the Italian villa of Sapienza, where he gets two new targets and a ton of options for dispatching them. We’ll have more to say about how it all holds together shortly, assuming I can stop getting distracted by this cell phone dude. Shortly after the new mission starts, you’ll see a guy in a grey shirt and shorts come wandering down the plaza stairs after finishing his cigarette. He gets a call on his phone. As it turns out, that call can be from a bunch of different possible people, and the game randomly selects one each time you restart the level. They’re unusually well-written, too. I became fascinated by these fleeting glimpses into this guy’s life and surprised by how much I related to them, so I cut together a video. Among other things, you’ll hear him grow frustrated with customer service (been there), get angry at the local video rental place for accusing him of having an overdue movie (been there), bend over backwards to avoid a fight about scones (been there more or less), and simply marvel at the weather (am there right now). The scones conversation in particular is just outstanding. I don’t know who comes up with the overheard dialogue in this game, but they’re doing great work.